Jangling cowbells give her a little warning but not enough time for the pretty young girl to escape the mischievous embrace of one of the masked Caretos de Podence. With one colourful woolly arm around her shoulders, he bats her hair with the tip of his long hood and bumps his bell-clad hips against hers in a manic dance. She squeals in mock horror while her family laugh and take photos. 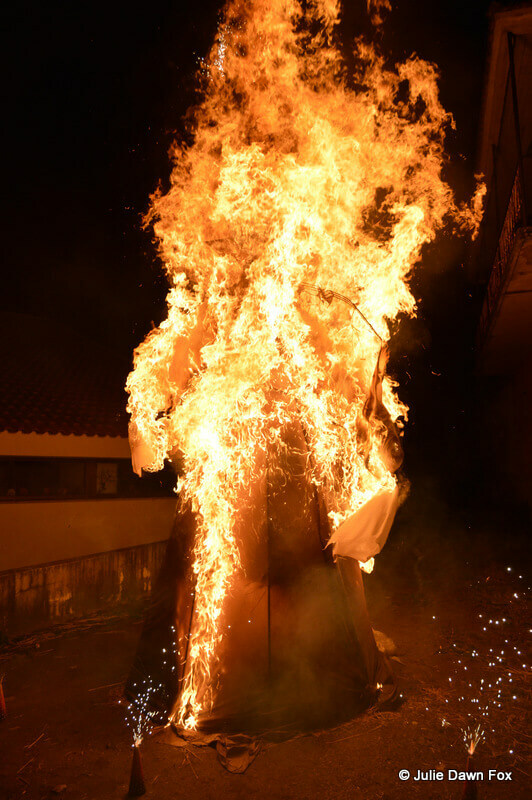 A careto is someone disguised as the devil during carnivals, the most common form of packing in as much fun as possible before the deprivations of Lent. 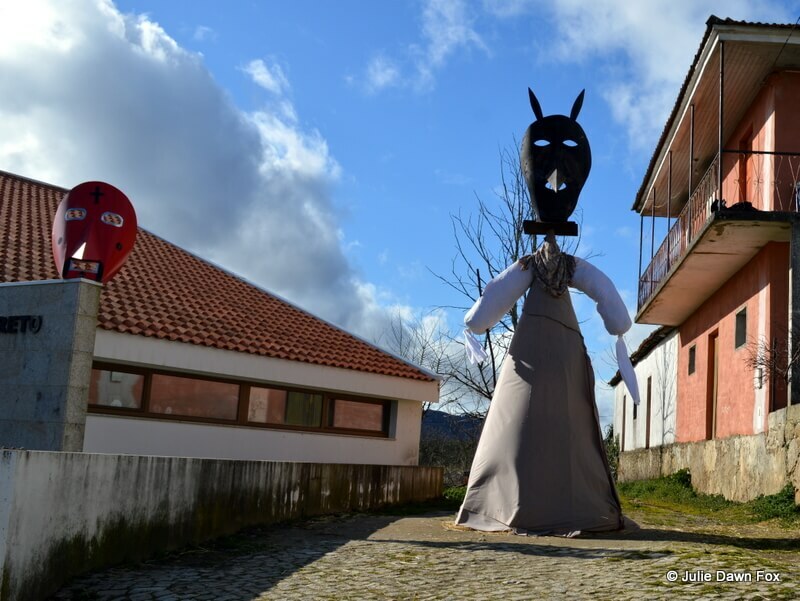 Unlike the flashy affairs in Brazil or even other parts of Portugal, there are no carnival parades with scantily clad girls and colourful floats in Podence. 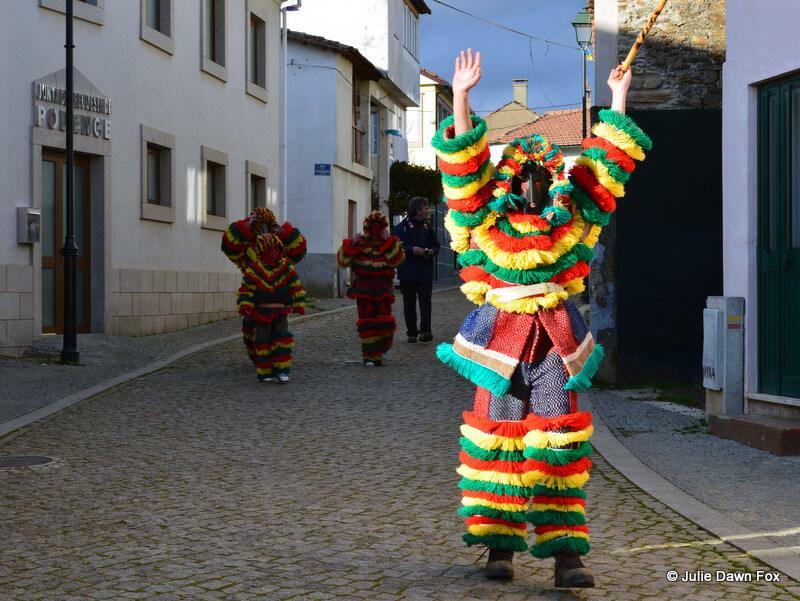 In this tiny village in Tras-os-Montes in the north-east of Portugal, there are 40 men dressed in stripes of red, yellow and green wool sporting leather belts with cowbells on. 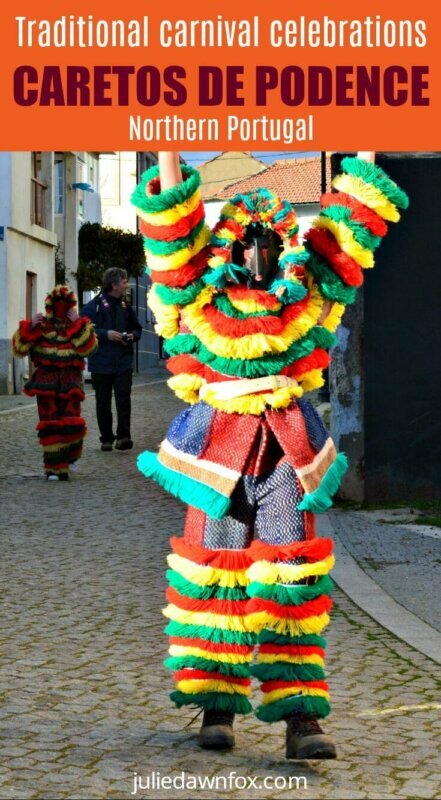 As Portuguese traditions go, this is one of the most colourful. The caretos of Podence spend the three days before Lent running wild in the streets playing tricks on the unsuspecting. I also got grabbed and bumped and although nowadays the pranks are relatively mild and playful, I felt a little bruised. I suppose I should be grateful that the days when these masked devil characters used to whip people with pig bladders and shower them with ash and manure are long gone. No wonder the village girls used to hide inside their homes back then. Not that doors would stop the caretos; sometimes, they’d bash down a door and overturn cooking pots full of the family’s dinner or even plunge people into a bath of ants. These days, they tend to stick to rocking cars, stealing jugs of wine, clambering over balconies, bashing people with their hoods and grabbing attractive young women. The only people who are exempt from the caretos’ mischief-making are the matrafonas. These are sassy creatures in women’s clothes wearing head scarves and with their faces covered by lace or cloth. Matrafonas eventually pair off with a careto in a mock wedding ceremony. 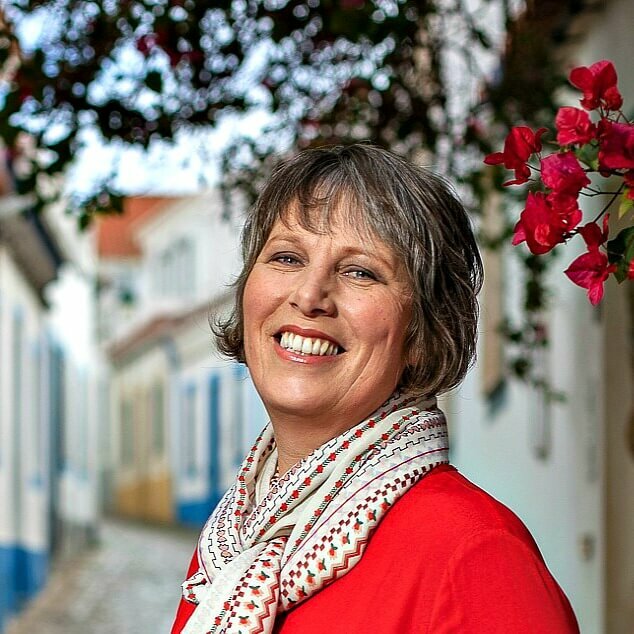 The careto tradition dates back centuries but almost died out back in the 1970s as many Portuguese people emigrated to escape from the Salazar dictatorship. The 1980s saw a revival and each year, the tiny village of Podence attracts an increasing number of visitors who join the local population for its entrudo chocalheiro (entrudo = pre-Lenten celebrations, chocalheiro = with cow bells). Even with a full programme of events, there is a lot of standing around in the cold waiting for something to happen so wrap up warm. While there are activities planned between Fat Sunday and Shrove Tuesday, the most fun-packed day is usually the Monday which, along with hairy Mirandese donkeys, masked men and feijoada (bean stew), brings medieval-style marching bands, fake marriages, burning effigies and a party that goes on into the small hours. When we arrived on Fat Sunday afternoon, our first careto encounter was with a group of facinitos (village boys who are caretos-in-the-making) clambering over walls and farm machinery to make some mischief. Apart from them, there seemed to be a distinct lack of pranksters so we had a look at the exhibition at Casa dos Caretos. In this small museum, you’ll find various life-sized models sporting a range of careto and matrafona costumes, as well as a collection of metal masks. Photos from previous entrudos will give you an idea of what’s in store, too. 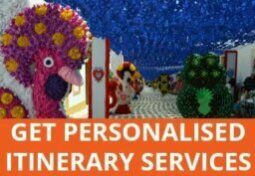 For the real thing, try and time your visit with the Caretos na Solta (Caretos on the loose) which tends to be scheduled for around 15:30 but check the programme first. Head up the main street toward the church before this to watch them gather on the steps then stand back as they burst forward in a blaze of colour and clanging, careering down the street to the food stalls where the main crowds collect. 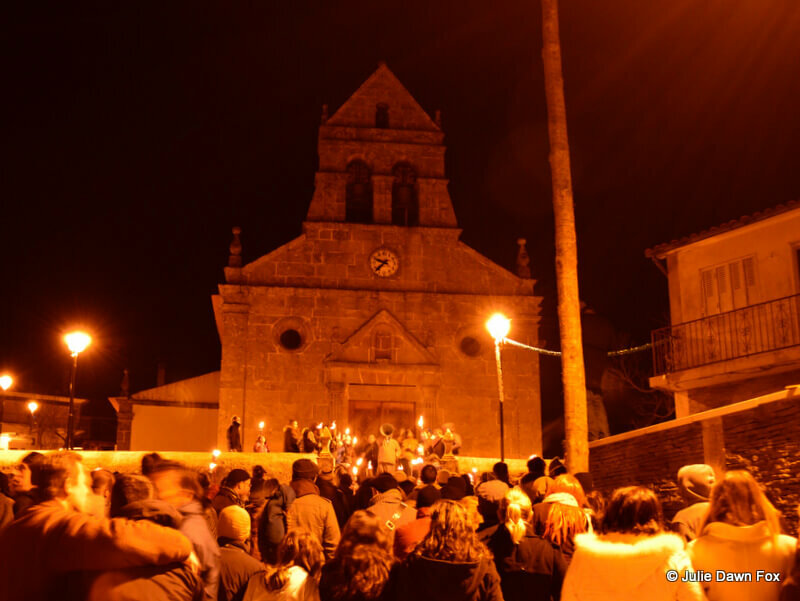 We made it up to the church on Monday evening, hoping to see the casamentos (marriage ceremonies) but although a crowd had gathered in the glow of street lamps and flaming torches, the only entertainment seemed to be a group of men using funnels as loud speakers to address us. I have no idea what they said but most people found it funny. After several amusing proclamations, a couple of Podence caretos bounded into the throng, snatched a flagon of wine and ran off down the street prompting a torch lit procession through the village which we gladly joined. A band with skin drums and bagpipes accompanied us and drew their own crowd once we reached the Casa dos Caretos. After the band had finished, and yet more milling around, the queimada (ritual burning) began. I’d worked my way to the front of the crowd, hoping for some good shots of the giant effigy going up in flames. As it happened, I was too busy leaping out of the way as sparks flew and bits of burning rag and paper twirled through the night sky towards the crowd. For those familiar with the UK’s nanny state approach to health and safety, Portugal is the complete opposite. It’s up to you to keep out of the way and there won’t be any warning signs or barriers to stop you if you intentionally or inadvertently put yourself in harm’s way. 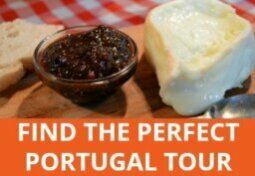 There’s not much in the way of hot food, except from the restaurant at Casa do Careto and the vats of feijoada on Monday evening, but the stalls sell all manner of smoked sausages, cheeses, dried beans and local brews. You can also get a shot of the local ginjinha (cherry brandy) to take the edge off the winter chill. We had our main meals in the nearby town of Macedo de Cavaleiros and ate chestnut soup and javali (wild boar) at Dona Antónia restaurant. 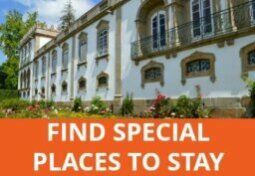 If you’re thinking of staying overnight, Macedo de Cavaleiros does seem to have the best options in terms of food and accommodation. We stayed at the very pleasant Hotel Muchacho. Thanks, Meri. It’s definitely different!